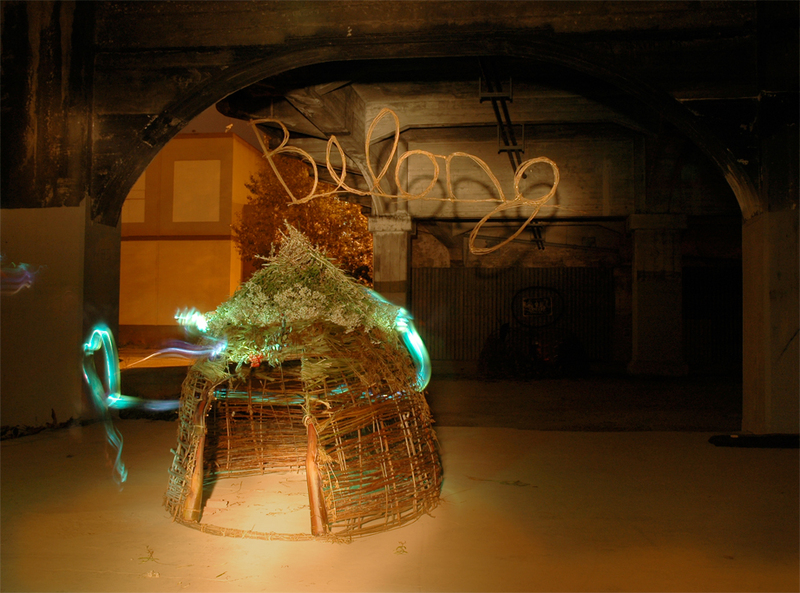 Belonging at Night - Light painting at night of the first shelter made with Blackberry vines. Thorns and All - The project was inspired by the thorns of the very invasive and prolific Blackberry vine as an expression of the pain and sacrifice inherent in living on the margins of society. Small Shelter - First attempt at working with the Blackberry. 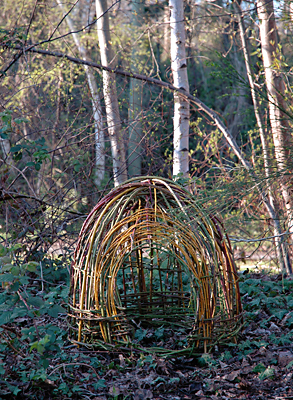 Incorporated Willow branches and found good gloves. 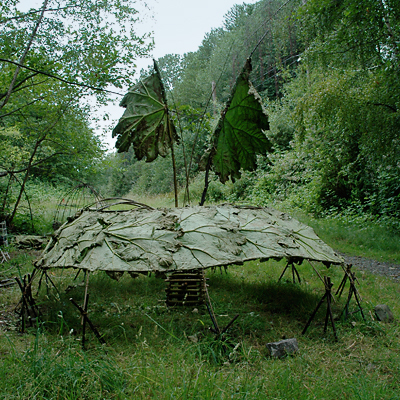 Shelter #1 - Shelter fabricated from Blackberry vines, Willow branches and a variety of plant materials found in commercial gardeners compost piles. 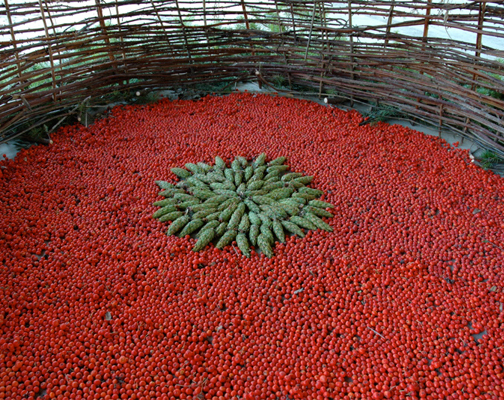 Berry Carpet - The shelter was remodeled on a continuous basis as plants withered and new ones became available. 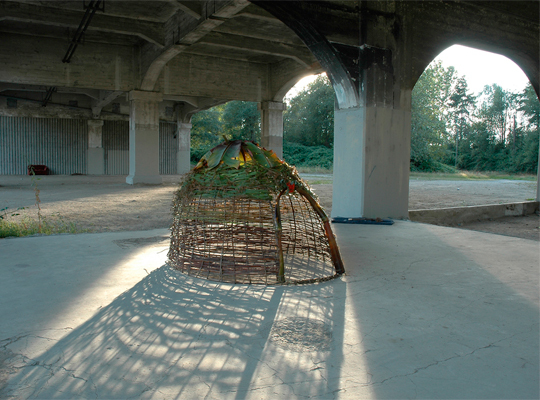 Here the inside is carpeted with Mountain Ash berries that grow profusely along the nearby railroad tracks. Weather Vane - Second Shelter was built as a open air sky viewing space with leaf flags acting as windsocks. The top is open and frames the sky. Gunnera leaves and Willow branches. 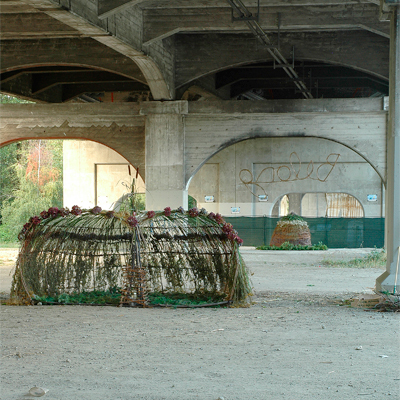 Amphitheatre - Inspired by the arrival of a local theatre company who put on a play under the bridge. 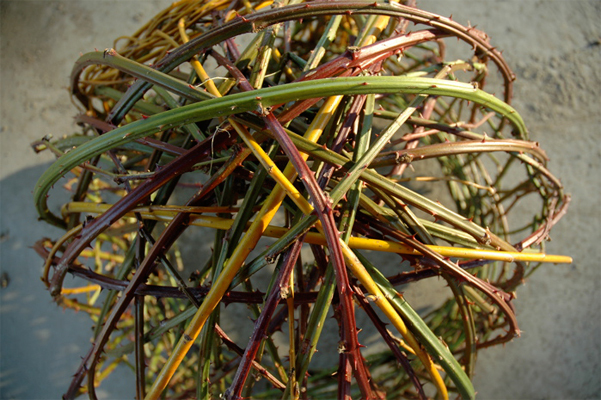 Willow branches, Cattail leaves, Hydrangea flowers and Yellow Tansy plants. 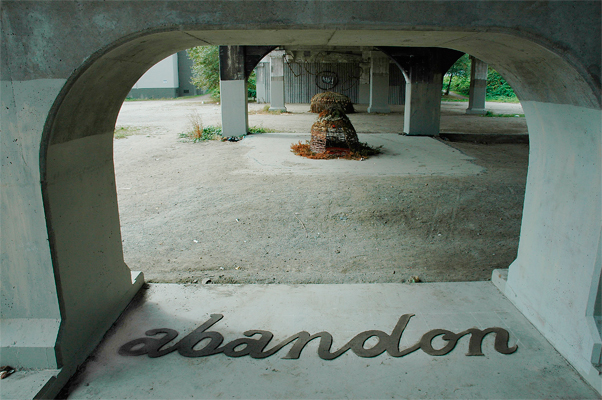 Abandon - Visual poetry made from mud on site. Cracked over days. Smashed up by cyclists. A is for dreAm - Over the summer many people interacted with me and with the project. 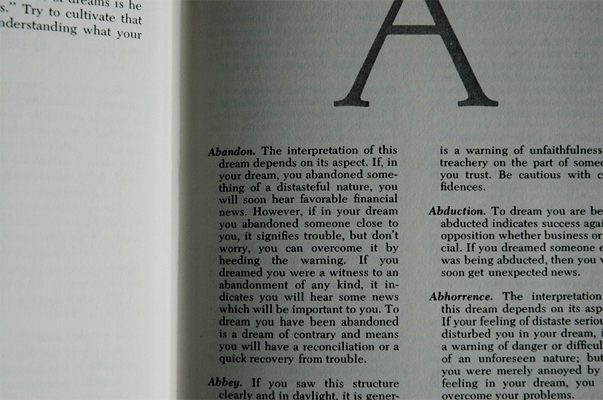 Often people left things such as this dream interpretation book found in my Amphitheathre shelter. I was glad to see the shelters being used. 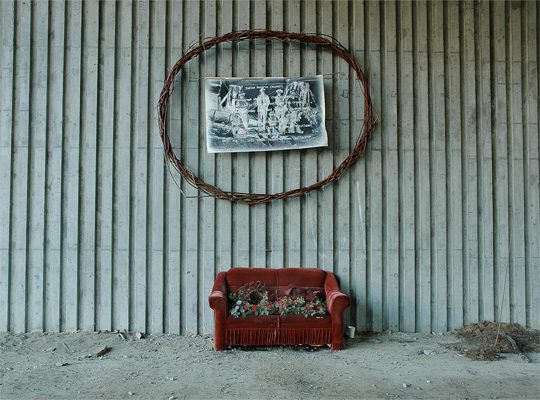 Snauq Garden - A photo of the original native inhabitants of the area once called Snauq framed by a crown of thorns is placed above a red sofa acting as a flower bed for shade plants. 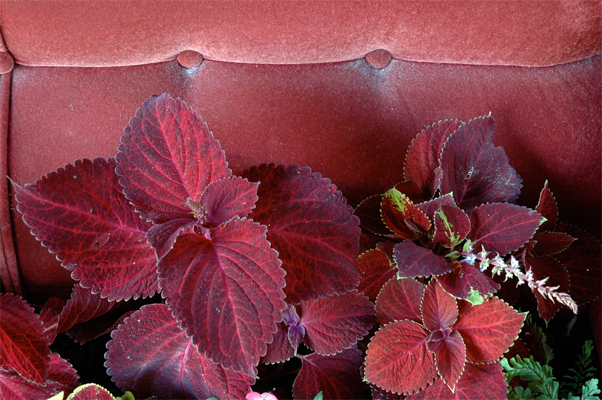 Red Shade -Shade plants Coleus, Impatiens and Ferns. Thank you to Frank the nearby gorilla gardener for the daily water supply. 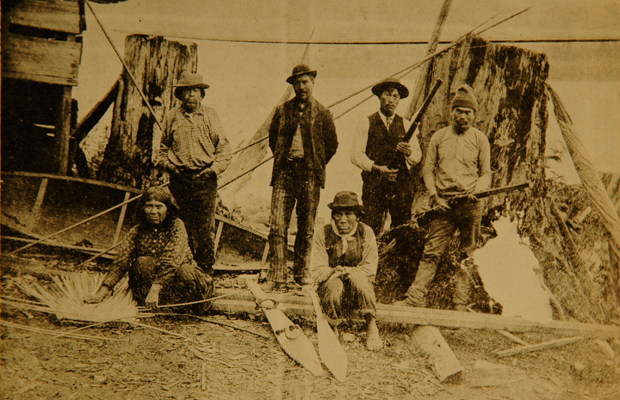 Jericho Charlie - Original photo, circa 1891 of some first nations inhabitants of this area including Jericho Charlie on the far left who was stepfather to Khahtsahlano (August Jack) after whom this area was named. 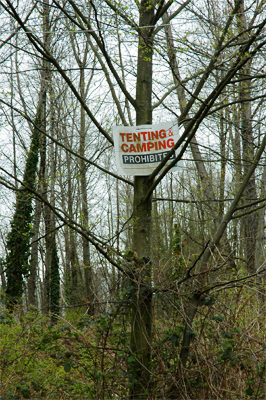 Prohibited - Temporary structures are not valued. The colonial system of determining property rights to those who “improve” the site by building a house still prevails. Belonging - Message left for me during my project. 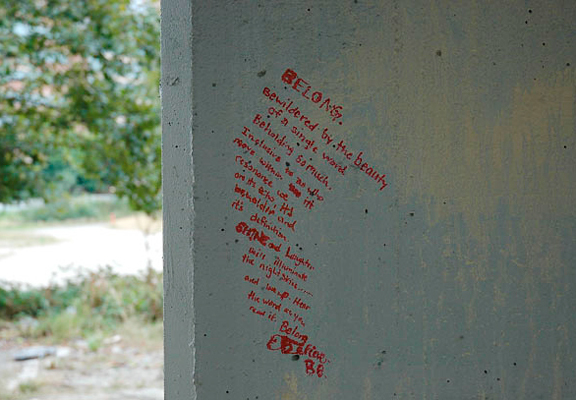 The issue of who belongs in this area is still not clear as the area has now been cleaned up; trees cut down, lots of gravel and aggressive graffiti removal. Modern Totem - The Squamish Nation is the only band who has been re-granted rights to a small parcel of land in this area. They have chosen to erect a billboard claiming it as their only option to provide revenue for their people.